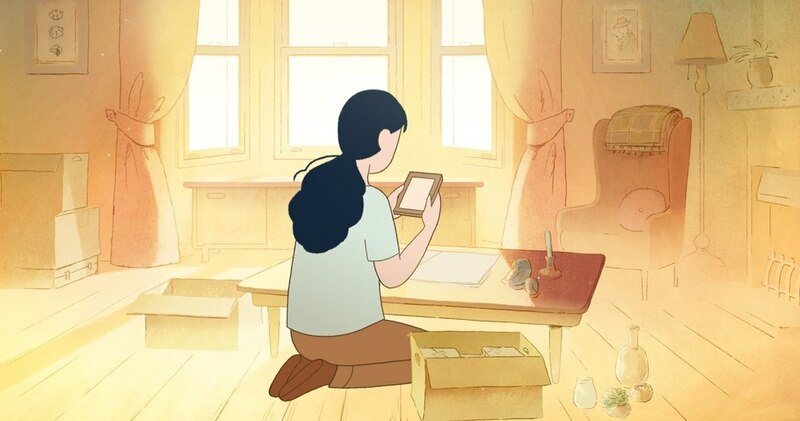 Louise Bagnall’s Late Afternoon tells a tender story, and is now Oscar nominated in the Animated Short category. Bagnall, unlike those of us on the West Coast was able to enjoy hearing her work had received an Oscar-nomination at lunchtime in Kilkenny, Ireland. Late Afternoon centers on Emily, an elderly lady who sits, disconnected from the world around her. Her memories drift between past and present as Bagnall touches on dementia, ebbing and flowing between the time spaces, washing in current memories, washing out the past memories. It’s a visually beautiful tale, wonderfully told. I caught up with Bagnall to learn more about Late Afternoon. What were you doing when the Oscar nominations were announced? It was lunchtime. Myself and my producer Nuria, we snuck away to watch them ourselves at a bar around the corner. We just couldn’t handle the pressure of watching it with everybody else. When we got the good news, everyone was celebrating and it was great news. I wanted to tell a story that revolved around a woman’s life, one that revolved around an exploration of her life and her identity. The memory loss aspect came in slightly later and it made sense because then I was able to weave in and out between different memories so that the audience could understand things from both her point of view, but also see her life being fleshed out on screen. It was an interesting way to explore the inner life and put it there. The animation with the dots for her face and eyes is reminiscent of older cartoons, so simplistic in the details. That was a personal preference. I prefer the pared-down simplistic approach. It allows the viewer to bring their own idea about what the character is feeling or doing at that moment. You’re leaving a certain amount to the viewer to fill in with their own imagination and that allows the audience to meet the character halfway. I think I wanted people to be able to project their own feelings of Emily onto her a little bit. She’s there and it’s slightly mysterious about how she feels about it all, as the film progresses, you can slightly understand it. With the memories, I wanted to show how incomplete they are. Sometimes we don’t have the full detail. We have the feeling. We remember the sound of something. Or we remember the sensation. I didn’t want it to be too detail heavy so that it’s a representation of the past. It’s more of an impression of what happened. I really loved your color palette choices between past and present. What were the choices in how you distinguished the use of color between time periods? It was a huge part of the film in the storytelling. We wanted the color to represent memories or something that would spark a memory. At the beginning of the film, the red is what reminds her of her own childhood. So, we picked warm colors to represent happy memories or exuberant memories. Later on in the film when things become complicated, the color palette becomes mixed. There are cooler colors to show the complicated. The colors represented either her state of mind or how she felt about her memories, whether it was positive or whether it was complicated. I read that you did the voice for Emily. How did that happen? What happened was that Fionnula Flanagan was doing Emily’s older voice. It was a great record and we were delighted with that, but it was hard to get Emily when she was younger. While we were searching for the right person to do the voice, I did scratch audio. I did a temp version so we could keep moving on with the animation process. We tried so many different things and by the end, it became obvious that I should do the voice. It’s hard to listen to your own voice. I had to pretend that I wasn’t listening to myself so that I could remember it was just Emily and not me talking. So, yes, I did do it and I wasn’t the first choice. How long did this take to come together from conception to end? It’s a relatively slow process. The idea was something I had a few years before we started making the film. From my point of view, it had been in my mind and sketchbook for a long time. Once we put it together and put in for the funding application and got it. Once we got the funding, we had ten months to make the film. I was glad I had time to think about the idea before we pitched it because by the time we got the funding, we had to go straight in with all guns blazing to get across the finish line in time. It was great and we got a lot of people to work on it and get it done. It was a really nice team effort. You’re now working with Nora Twoomey who did The Breadwinner. I’m so excited to be working with her on My Father’s Dragon because she is an amazing director and filmmaker. She is very invested in the story she tells and it’s been so excited to work with her. I’m the assistant director so it’s great for me because I get to work really closely with her and learn from her and the whole team. It’s still early days though.